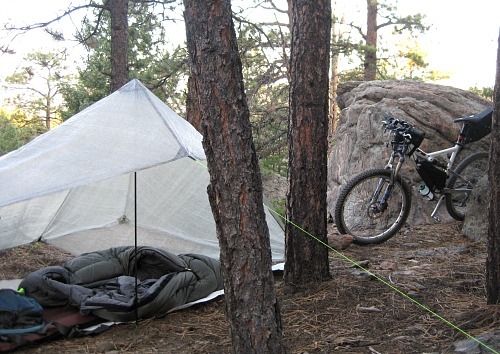 The extreme polar vortex or winter weather in general can lead to daydreams of bike touring on a warm summer day. Now is the time to plan for that trip so that it can become a reality. My own reality is that the Tour Divide ride start in 5 months and I need to save quite a bit of money prior to the departure. As part of the trip planning, I remembered the book ‘Dream, Save, Do‘ by Warren and Betsy Talbot. For anyone that dreams of adventures or audacious trips, the book is a must read. It has lots of practical advice on how to make the trips a reality, but it also contains stories about others that have already done it. As I read through the book, their concept of calculating a cost per day for their trip really caught my attention. The idea is to calculate how much needs to be saved to make the trip a reality and then divide that total by the number of days in the trip. The result is a tangible number that can be used when saving money to make the trip happen. Instead of focusing on a total that is likely thousands of dollars, one can focus on a per day number that is likely around $100. Then, each time $100 is saved or made, a day of the trip is funded. Brilliant! Being the numbers geek and planner that I am, I decided to build a spreadsheet specifically for cycling that calculates the cost per mile for a trip. As the savings accumulate, more miles of the trip are funded. Each time a lunch is brought from home, there is a savings but more importantly, a mile of the trip is funded. Or, on a bigger scale, the extra $200 saved each month from reduced expenses funds several days of bike riding. When each action can be measured in miles, something a cyclist is deeply familiar with, the savings process becomes much easier. When there is temptation to spend, one can ask themselves if spending X on an item is worth not funding Y miles on the big trip. Not only does the spreadsheet calculate the cost per mile metric, it also breaks down a monthly savings goal to fully fund the trip prior to departure. Enter in the expenses for the trip, the number of months until departure, and voila, there is the savings per month number that needs to be achieved. For my own trip, seeing the total cost was a little scary. The biggest expenses were a new bike (not truly necessary but certainly a lot of fun) and replacement income for my unpaid time away from work. In addition to those two biggies, there is also the cost of living while on the trip. The costs of food and hotels can quickly add up so it’s good to have those planned out instead of ending up with a large credit card bill at the end of a trip. Download the spreadsheet, calculate your costs and savings, then make that dream trip a reality. Seeing the total cost may be daunting, but the sacrifices to fund the trip will be worth it.